Our body parts deteriorate over time with use – like cars exposed to friction on tires, brakes, and carburetors, we deteriorate not because of the passage of “time” but as a function of our mileage, maintenance, and accident history. Speaking of replacement parts, did you know many scientists believe that NONE of cells comprising your body were present ten years ago. You are comprised entirely of new cells generated from stem cells in your body. You Do Make New Brain Cells! Received wisdom tells us that you can’t make new brain cells. 99% of MD’s will tell you that. Actually, your hippocampus, a site of memory generation, makes about 10,000 new neurons a day using neural stem cells. When you sleep, your memories are pruned and organized for storing memories. It’s a physical process and it is enhanced by taking TA-65. 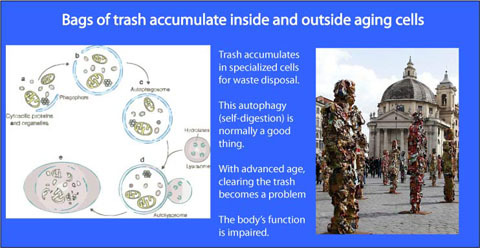 Cells must clear waste products but when they grow old (or senescent) you can observe small bags of junk inside them and large bags of junk outside them. It is likely that the waste is the result, not the cause of cell dysfunction. Each cell hosts hundreds of mitochondria, the symbiotic critters that generate the energy in the form of ATP. In our old age, our mitochondria sabotage our cells in a variety of ways. They become like Homer Simpson at the nuclear power plant, pouring out reactive oxidative species (ROS) that are a danger to themselves and the host. Although anti-oxidants are touted by anti-aging gurus, taking anti-oxidants is like trying to put out a kitchen fire by spraying the outside of the house. If this is the first you’re hearing about telomeres, you’re in good company; most physicians have never heard of them either. But go to the US National LIbrary of medicine, PubMed, and type in “telomere” – you’ll retrieve over 10,000 articles in the scientific literature. In the laboratory, telomerase activation by TA-65 has been shown to activate telomerase and restore cellular immune function. After four years of ingestion, Dr. Park has grown younger by 16 years worth of telomere length! His continuous review of the scientific literature has led him to propose this simple and integrated theory of aging: cells generated from stem cells in your body. Axiom 1: Because of the mechanics of copying DNA, telomeres always grow shorter with cell divisions. Axiom 2: Stem cells and Cancer cells (possible mutant stem cells) are capable of self-immortalizing by lengthening their telomeres with telomerase. Corollary 2.1: telomere length in stem cells is dynamic and lengthens or shortens as a function of telomerase activation, replicative burden, and environmental effects. Axiom 3: Differentiated, or non-stem cells cannot be younger (telomere length) or healthier (genetic integrity) than their most recent stem cell progenitor. Axiom 4: For non-stem cells, which don’t produce an active form of telomerase, the Hayflick Limit is the cause of apoptosis (“programmed” cell death) and teleologically serves to protect us from rogue cell lines that have acquired dangerous changes from DNA transcription errors, erroneous splicing, and oxidative or ionizing stresses. By standard definitions, “Aging” is not a disease.